GAT-1 antibody LS-C15296 is an unconjugated rabbit polyclonal antibody to rat GAT-1 (SLC6A1). Validated for ELISA, IF, IHC and WB. SLC6A1 / GAT-1 antibody was raised against a 19 AA synthetic peptide in the middle of rat GAT1. The peptide was synthesized with an added cysteine amino terminal and conjugated to KLH. Recognizes rat GAT1. Species sequence Homology: mouse and human: 100%. No significant homology with any other known eukaryotic protein. Suitable for use in Immunofluorescence, ELISA, Western Blot and Immunohistochemistry. Western Blot: 1-10 ug/ml using Chemiluminescence technique We recommend the use of 0.5-1% milk in all primary/secondary antibody-enzyme conjugate incubations in order to suppress non-specific bands. ELISA: 0.5-1 ug/ml for affinity purified. 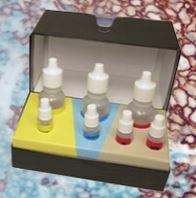 Control peptide can be used to coat ELISA plates at 1 ug/ml. Immunohistochemistry/Immunofluorescence: 2-10 ug/ml in paraformaldehyde fixed sections of tissues. 100 mM Tris, pH 7.5, 0.2% BSA, 40% glycerol.